Effective and successful leadership is not an accident and requires specific and measurable leadership skills. Organizations, teams, and families are always a reflection of the competence of the individuals leading them. 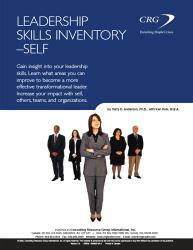 This 20-page Leadership Skills Inventory-Self (LSI–Self) provides leaders with the necessary metrics to develop their transformational leadership skills with a section provided to plan for your leadership development. CRG’s Transforming Leadership model, on which the LSI–Self is designed, continues to be validated in various leadership research. Most recently, the work that Jim Collins conducted for his book Good to Great aligns with the LSI–Self model and competencies. The Leadership Skills Inventory–Self supports anyone in a leadership or supervisor role to first benchmark then outline specific steps to increase and improve his or her leadership effectiveness.